When I get asked about my favorite hill station, my answer always is Chitkul. It has been a decade since I first visited here in July 2008; and since then it has remained on top of my “most scenic places” list. This tiny hamlet hidden in the remote hills of Himalayas looks like a picture straight out of a painting. Surrounded by hills from three sides; a road leading up to it and then ending at the village; a river flowing down from up the mountains with sun rising in the backdrop; yes that is Chitkul for you. A place that you used to see in paintings and wallpapers and then suddenly arrived there yourself. For a brief introduction, Chitkul, also known as Chittkul is a small village in Kinnaur district of Himachal Pradesh. Situation on the banks of Baspa River, it is the first village of Baspa valley and the last village on the old Hindustan-Tibet trade route. The road to Chitkul bifurcates from Hindustan-Tibet Road (NH 22) at Karcham; from where, Chitkul is approximately at a distance of 40 kilometers; while crossing the Sangla village on the way. The road ends at Chitkul making it the last inhabited village on Indo – China border. Chitkul is best known for its extremely beautiful and picturesque location. On one side of the Baspa River are snow-clad mountains; and on the other side the whole terrain is full of apple orchards and wooden houses. During winters, the entire place mostly remains covered under a thick sheet of snow; and even the locals move to lower regions of Himachal for a few months. Chitkul is located roughly around 600 kilometers from Delhi; about 350 kilometers from Chandigarh; and about 250 kilometers from Shimla. It is a 2 days journey from Delhi and Chandigarh; and one day from Shimla. The road doesn’t actually take you all the way till the actual border. It ends around 90 kilometers before it at Chitkul; and then rest of the area is under the control of Indian Paramilitary force ITBP. 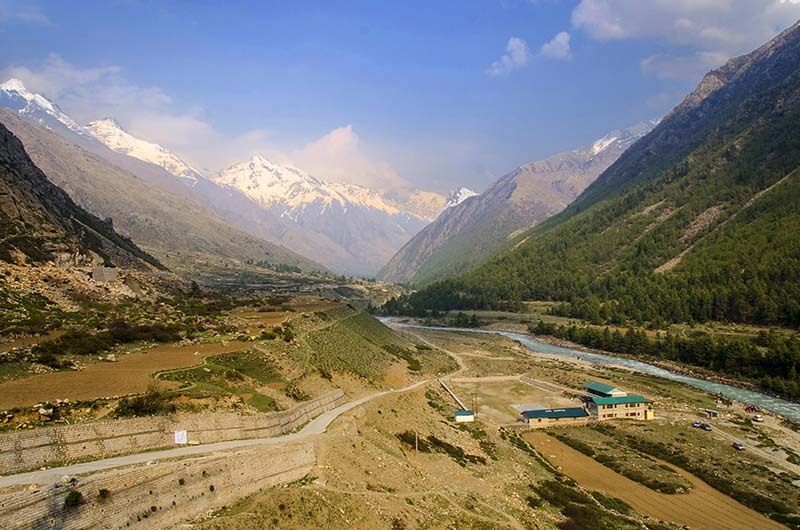 The first question that comes to mind is why visit Chitkul and what does it have to offer? To be honest, there is nothing at Chitkul. It is just tiny village with a handful of houses only. It is not really a place for people who like visiting tourist destinations like Shimla and Manali. That set of people will definitely get disappointed here. It is however a perfect location if you want to spend some time away in peace and tranquility; away from the crowd at an offbeat destination. The only thing to do here is to sit and relax the natural beauty all around you; to savor on the mesmerizing vistas and listen to the silence. If you are into trekking than there are a few trails from Chitkul that you could venture out on. It is the start point for Lamkhaga pass trek and Borasu pass trek. For a single day trekking, Nagasthi ITBP post is 4 kilometers and is a easy to moderate walk. Further ahead is Ranikanda meadows, about 10 kilometers from Chitkul. This same trek than takes you up to the Lamkhaga Pass and ends at Gangotri. Chitkul usually gets included in the itinerary by people who are out traveling on the Spiti circuit; or covering the entire Kinnaur valley. But if you have a few days in hand and wanted to visit a scenic but lesser known location than Chitkul would perfectly serve the purpose. How you can plan your journey here is what I will provide details on in this article. There are two ways that you can get to Chitkul. The shorter and easier route is via Shimla; while the longer and tougher one is via Manali. If you are into trekking then of course you can also reach Gangotri first and then trek to Chitkul from there; but that is a topic for another article at another time. For now, I will explain how you can reach Chitkul via Shimla or Manali. The nearest airport to Chitkul is the Shimla airport located in Jubbarhatti. After Shimla, the next nearest airport is the Bhuntar airport between Chandigarh and Manali. These are however small airports and flights to both these places are limited. The nearest major airport is at Chandigarh which is connected with several flights from all over the country. The nearest train station also is at Shimla but like the airfield, this train station also is a small one; connected to Kalka by the famous Kala – Shimla toy train. The nearest major railway station is at Chandigarh; trains to which are available from all major cities in the country. You can also reach Chitkul easily by Bus. Shimla is very well connected by daily buses to almost every major city nearby. Once you reach Shimla, you have two choices. You can either board a direct bus to Reckong Peo or Sangla. Of these two, Sangla would be the preferred one but you can board either one that matches your timings. There are daily buses from Sangla and Reckong Peo to Chitkul which you will board finally to reach your destination. Another choice is of hiring a private cab from Shimla to Chitkul but that will cost you at least Rs. 12,000 to Rs. 15,000. It can however be a good choice if you were traveling in a group of 5 – 6 people that can all share the cost. One thing is for certain when it comes to the weather in Chitkul. No matter which time of the month you travel here, it will always be very cold. Weather changes very rapidly and even in summers a sudden fall in temperature may trigger winter like conditions. I have been to Chitkul in the months of May, June and July and even at this time, when the summer season is burning up half of north India; the temperature here never went beyond 10 degrees Celsius. Nights here will get extremely cold with temperature dipping close to 0 degrees even in summer. Monsoon arrives by mid to late July and remains all of August. During this time, it rains heavily in the region and landslides become common. Sometimes it rains so heavy that entire sections of the roads get washed away; cutting off the area for several days. Come September, winter will start to settle in and by December, it can snow here anytime. By January, the entire region gets buried under heavy snow and even the road from Karcham to Chitkul gets blocked completely. From September till April, it gets so cold here than even some of the locals leave the area. What kind of clothes to bring for Chitkul will really depend on the time of the year you are arriving here. A warm, thick and windproof jacket however is must irrespective of the month. If you were planning a winter trip, then ensure that you are carrying all heavy woolens, waterproof gloves and waterproof shoes (so you can walk in snow if required). Also make sure that your jacket has a hood to protect your head, neck and face. During summer however, carry your regular cottons with some light woolens; a heavy windproof jacket and that will be sufficient. While visiting in the months of July and August, ensure that you are bringing clothes that can dry fast; polyester for example. Proper rain gear inclusive of a good quality waterproof jacket along with a good umbrella will be a must for visiting Chitkul during monsoon. The best time to visit Chitkul in my opinion would definitely be the month of September. Why September? Because this is the time when the entire Kinnaur valley would actually be alive. When I say alive, I mean lush green with flowers of several colors blossoming all around. You can actually get to see this in the months of July and August as well but that is the time of monsoon and would involve risking rain. In September however, monsoon would be long gone but green will remain. A bad time to visit here would be peak winters; unless you came here looking for it. The road to Chitkul can get cut off for months altogether due to heavy snow and if you happened to be here around that time, you will be stuck. In 2011, over a 100 Bengali tourists were stuck at Chitkul due to extreme weather and it was weeks before they could be rescued. So unless you were looking for some extreme adventure and were prepared to be stuck here for months; then you may come to Chitkul in winters; otherwise avoid it. You may visit here in the months from March till June or October and November but at this time, the mountains around will be missing the green. Except for the natural beauty, there is nothing to see here in particular. But it is the natural beauty itself that will keep you busy for days. You can go for short day long treks as I mentioned above in the article. The nearby town of Sangla has a Kamru fort and Nages God temple that is worth a visit. If you have a few days in hand, then you can also include places like Kalpa and Sarahan in your trip; thus covering the entire Kinnaur Valley. I have explained this in form of an itinerary further in the article. There are several hotels in Chitkul and you will easily find a place to stay here. There are several budget hotels as well; but to be on a safer side, keep a budget of around Rs. 700 – Rs.800 per day minimum for your stay here. There is also an HPPWD rest house here that you can get for around Rs. 500; but I wouldn’t recommend staying there. The rest house is in a very bad state and the caretaker is really a jerk. Just take a walk around the village and check into any hotel that looks the best to you. There isn’t any special dish that they serve here in Chitkul; but most of the basic north Indian food remains available. Depending on your choice, you can either eat at your hotel itself or at any of the small Dhabas that are available all over the village. None of course. It is just a tiny village and there is nothing of interest here that you would want to buy; at least nothing that I noticed. On the way however, there is the small town of Sangla that is bigger than Chitkul in size and has some Himachali handicrafts available if you are into that sort of thing. There is no Bank or ATM in Chitkul but Sangla has an ATM about 20 kilometers before Chitkul. I have withdrawn cash from this ATM every time I went to Chitkul and found it to be functional always. There are several petrol pumps en route as you move from Shimla towards Karcham. However there is no gas station in the last 40 kilometers from Karcham to Chitkul. The last mechanic available en route will be at Sangla. The nearest hospital or medical assistance is available only at Sangla for small ailments. If it is something serious, then you would have to go to either Reckong Peo or Shimla. Only BSNL works in Chitkul but the reception is not that great. You will be able to have a conversation on the phone but voice clarity will be bad and the phone will continue to go on and off the network. Data connectivity will be pathetic; slower than even 2G. If you were on any other network then your phone will continue to work fine until Sangla but will go dead the moment you cross it. Assuming that you were coming from Delhi, on Day 1 you can either reach Shimla or Narkanda. I personally find Narkanda to be a better place for night stay for two reason. First is that Shimla is way too crowded for my taste. Second is that staying at Narkanda also reduces the travel time on Day 2. You can start early from Narkanda, possibly by 7 AM and will easily make it to Chitkul by 2-3 PM. 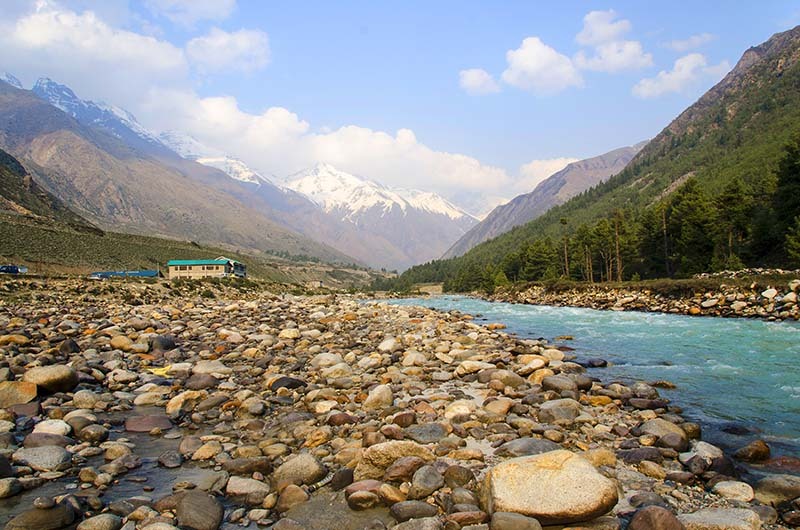 Spend your 3rd Day in Chitkul itself and then return to Delhi on Day 4 and 5. An ideal way would be to add a few more days to the journey explore more. You would anyways be traveling for 5 days so spend a couple of days more in the beautiful Kinnaur valley. The itinerary can be as below. Another itinerary can be like bellow but this would mean that you will be traveling on entire Spiti circuit which also has some of the worst sections of road that you had ever been on. This is just a sample itinerary and you can definitely stretch it by adding more places if you had more time. Starting from Delhi, the roads are mostly all good until Karcham. The last 40 kilometers between Karcham and Chitkul will be a mix of good, bad and ugly. If however you were completing the entire Spiti circuit, then from Karcham to Kaza will further be a mix of good and bad. From Kaza to Manali is an extremely bad and nightmarish drive. From Manali to Delhi is mostly all good with a few bad patches in between. I hope the information above was of help. If you need any further information; or have any other questions; please feel free to ask in the comments section below; or at our Community Forum; and I will be glad to answer. I am planning to visit chitkul on the second week of July – Exact time taken from Shimla to Chitkul would be? As per google it says around 8 hrs is this the correct calculation? Hi Shongruff – Thank you for your kind words. When are you planning to go? Will there be the any bus from Shimla to Sangla in the month of January? It depends on the weather really. If there is no snow on the road and weather is clear then the Bus may remain available. If there is snow blocking the road then there will be no Bus service. I am planning to reach chitkul by tommorow. Can you suggest available busses and their timing from rampur to chitkul. I too am planning to visit by end of this month. Can you please describe the condition that is there now? Is the route to Chitkul open? Are buses plying? the article is really very detailed and considerate of almost all help. Thanks for taking the time to drop a note Shailesh. I am planning to visit chitkul on Dec 30 this year from delhi and will depart from there on 2 January. Just wanted to check the possibility of snowfall and if it does what will be the road conditions? Will it get blocked or it is possible to commute? Hi Himani – It all depends on the weather really but there is a high chance that it will be all snowed out by Dec 31st. You may even get stuck in Chitkul as a matter of fact. It has happened before and people had to be airlifted out of there. Thank you Mr. Kundu. September is actually a very good time to visit Chitkul. Riveting write-up Vargis! Do check blogs on trek routes around Baspa valley on my site. Thank you. Thank you Sonu. I will definitely check it out. Do you arrange trekking in Kinnaur valley? Yes! I do organise trekking trips around Kinnaur- Spiti and Kinnaur – Garhwal region. We will definitely meet the next time I visit Kinnaur Valley. Would love yo go out on some treks with you. I have never done trekking so it would be a good and new experience. Wonderful information dear and I was looking a place where I will get peace and may be ur suggestion fulfill my wish….thanks for all ur useful information keep writing….